The votes are in and Moonshine Falls takes second place to the cables you gotta cross to get there! 3 miles in and 3 miles out. What an adventure - one none of us will soon forget. 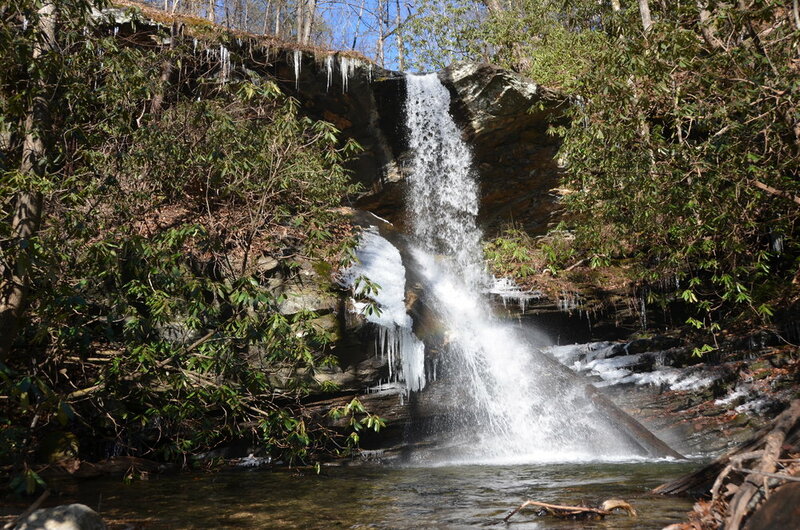 Asbury Hills is kind enough to let folks access the trail to Moonshine Falls through their camp. The entrance is gated however, and you need a code to get in on the weekends. Call ahead or email them - they are very quick to respond and quite friendly! Trust me, you don't wanna drive all that way and then not have a code to get in (been there, done that) Also note that they are closed when summer camp is in session, which is May 15th - August 15th. So plan ahead friends! Be sure to print off Asbury Hill's map before you go. The trail is marked with red blazes, but it gets a little tricky as there are quite a few connecting trails along the way. 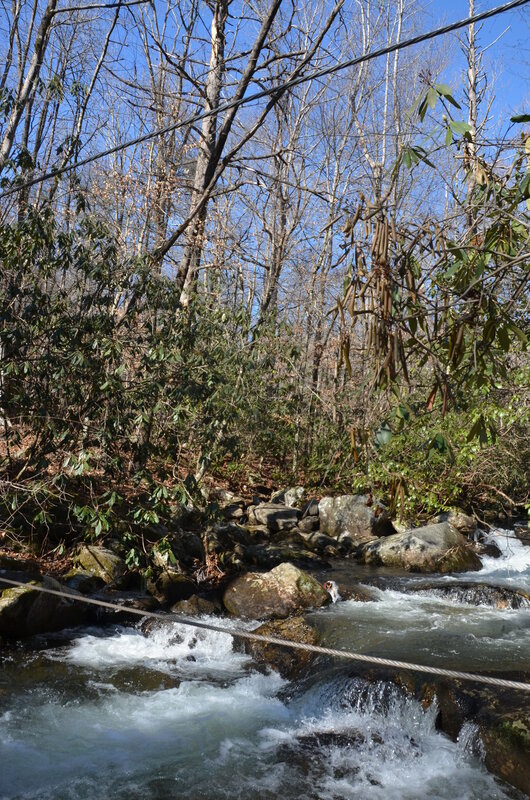 SUCH AS the Naturaland Trust Trail, whose blaze is pink which looks kinda like red and can easily lead you far, far away from Moonshine Falls. Which some might think of as an adventure...while others might end up in the dark, crying...(pretty sure I would be the second)It's a beautiful, fairly easy hike. Just a little long, you know, for certain tweens who have MUCH better things to do with their life. But I'm telling ya - the cable crossing over Matthews Creek and the falls themselves are worth every step. And my kids LOVED it. The cable crossing is over a rocky creek, so it's not for little ones, unless you carry them across. Which I did with my youngest and it was fine. Just be careful, and as the sign shown further down says, "Respect your physical limitations"! After crossing Matthew's Creek, you've still got a ways to go before arriving to the falls. You will pass several markings and signs along the way. Pay attention to these and your map and you will be all good. 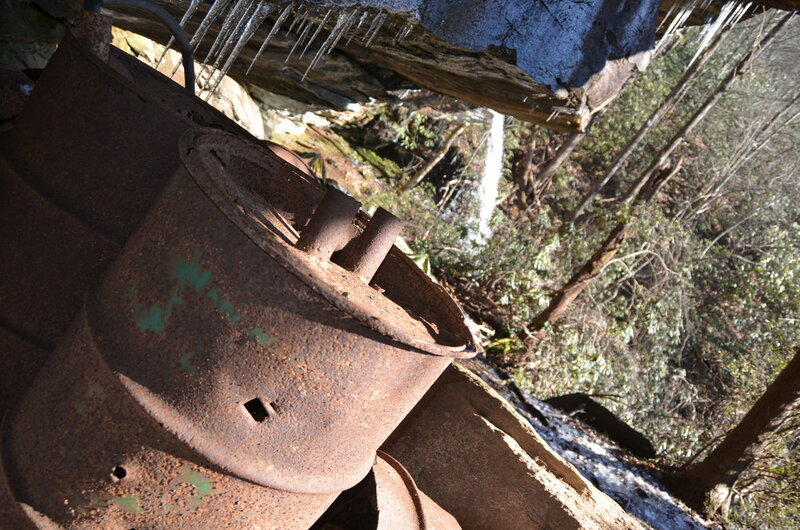 AND FINALLY...Moonshine Falls. We put on 50 layers and braved the cold, which turned out to be a great decision. 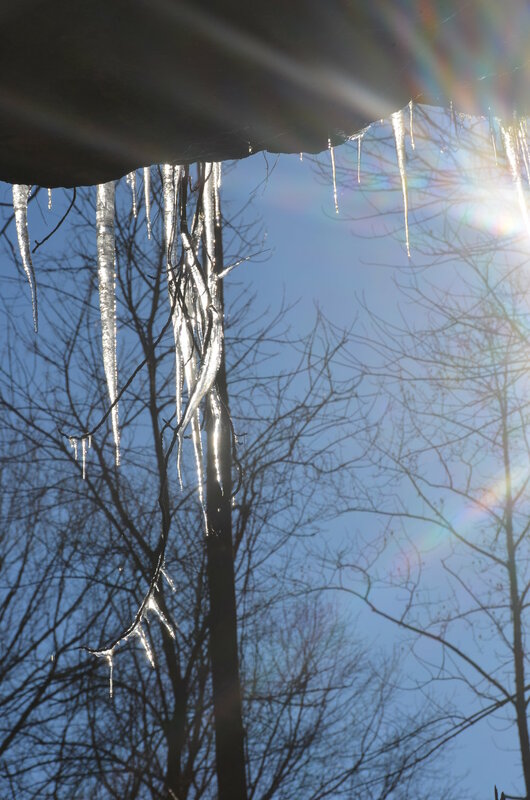 Icicles everywhere...it was a winter wonderland. Beautiful with the lush green mountain laurel and 40' waterfall. Fun fact: You can go behind this waterfall. And make you some Moonshine. Just kidding y'all, don't do that. Seriously though - the barrels are still there and it's a huge cave. We stayed here and explored for long time. Plan on a good half day to full day for this hike. Especially if you want to explore or have kids with you. Moonshine Falls was one of my hiking goals for the year...checking that off felt great! Loved this adventure. And the fact that our day of hiking ended with the view below was really neat. My legs were sore, my heart was full.